We propose a general Langevin equation describing the universal properties of synchronization transitions in extended systems. By means of theoretical arguments and numerical simulations we show that the proposed equation exhibits, depending on parameter values: (i) a continuous transition in the bounded Kardar-Parisi-Zhang universality class, with a zero largest Lyapunov exponent at the critical point; (ii) a continuous transition in the directed percolation class, with a negative Lyapunov exponent, or (iii) a discontinuous transition (that is argued to be possibly just a transient effect). 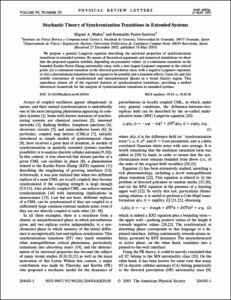 Cases (ii) and (iii) exhibit coexistence of synchronized and unsynchronized phases in a broad (fuzzy) region. This reproduces almost all of the reported features of synchronization transitions, providing a unified theoretical framework for the analysis of synchronization transitions in extended systems. Muñoz, M.A., Pastor-Satorras, R. Stochastic theory of synchronization transitions in extended systems. "Physical review letters", 19 Maig 2003, vol. 90, núm. 20, p. 204101-1-204101-4.